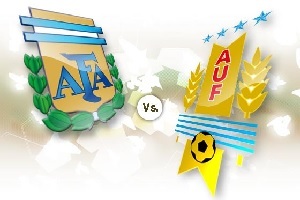 Argentina is facing Uruguay in Group B of the Copa America. Although Argentina dominated all game against Paraguay, they failed to win that game. The attacking side was great, Aguero and Lionel Messi both scored in the first half. The possession of the ball was in their favor 69%, they had 9 corners and a good amount of shots on target. But the defence was awful and they have something to worry about if continuing to play that way. Uruguay is the defending champion in this competition. But they won against Jamaica with 1:0 and both teams played as equals.Without Luis Suarez ( suspension ) it will be very difficult for them to retain the trophy. This is a must win game for Argentina if they want to be at the top of Group B and I am sure they will!